This is it. 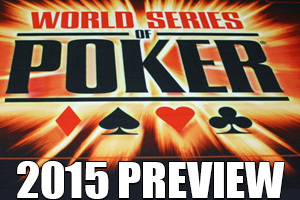 We’re less than one week away from the start of the 2015 World Series of Poker. It’s the 46th annual event, and it’s way bigger than just the Main Event. This year’s series features an impressive 68 big events and covers off everything from Hold’em to H.O.R.S.E to Omaha to Stud, and everything in between. This year also mark’s the start of something completely new and different – yet something that’ll be completely familiar to the scores of people who play online poker, use poker sign up bonuses to boost their bankroll, and chase dreams from the comforts of home. We’re talking about the world’s first WSOP online poker event. Read on to learn more about that, plus all the other big events worth talking about. What’s so special about the second event of the 2015 World Series of Poker? Well, it’s the first event of the series, or at least the first event open to the public. Event #1 is a Casino Employees No-Limit Hold’em poker tournament, so unless you’re an employee, we recommend starting with the 4pm event. If you got $5,000 and crave fast action (the kind of action that you’ll know about if you take advantage of poker sign up bonuses and play online poker), you’ll ant to grab your cash and enter the Shootout No-Limit Hold’em tournament. There’s room for just 2,000 players, so register early. Got $1,500? You could turn it into $1 million. Event #16 guarnatees to pay out a first place prize of $1 million, so expect this event to be backed with bracelet-chasing dreamers who want to turn their online poker skills into a WSOP bracelet. For $10,000, you can play in this year’s Ladies event. And here’s the interesting part. You don’t have to be a female poker player to enter this. Technically, it’s open to anyone. But ladies are encouraged to enter thanks to a $1k discount that brings the buy-in down to $9k. Expect to see a lot of big name poker players in this one. The buy-in for this poker tournament is $111,111 and past winners of big One Drop events (including the $1 million buy-in tournaments) have included Antonio Esfandiari and Daniel Coleman. If The Big One is too big for you, give the baby version a try. It costs just $1,111, a far cry from the $111,111 that will ultimately attract the richest poker players on the planet. But who knows? Do well in this one and you could end up playing in the high roller’s version in 2016. For the first time ever, the World Series of Poker will include an online poker tournament. Just like any of the live bracelet events, the tournament will crown the winner with a coveted bracelet. And here’s the best part. If you can play online poker, you can play in this tournament. Well, you’ll need to be in Nevada to play. And, of course, you’ll need to be 21. But as long as you’ve met that criteria, you can be a part of this historic event from the comforts of anywhere you can get an Internet connection. The tournament will take part entirely online, up until 6 players remain. At that point, the remaining players will convene in Las Vegas at the Rio to play out the final table live and in person. But don’t worry. While the final table resumes live, the online element will remain as the table will be streamed for everyone to enjoy.